The painting, From Field to Market, was created by Gary Kelley for CoBank. It's displayed in the CoBank Lecture Hall at the University of Colorado Denver Business School where college students study economics and commodities. 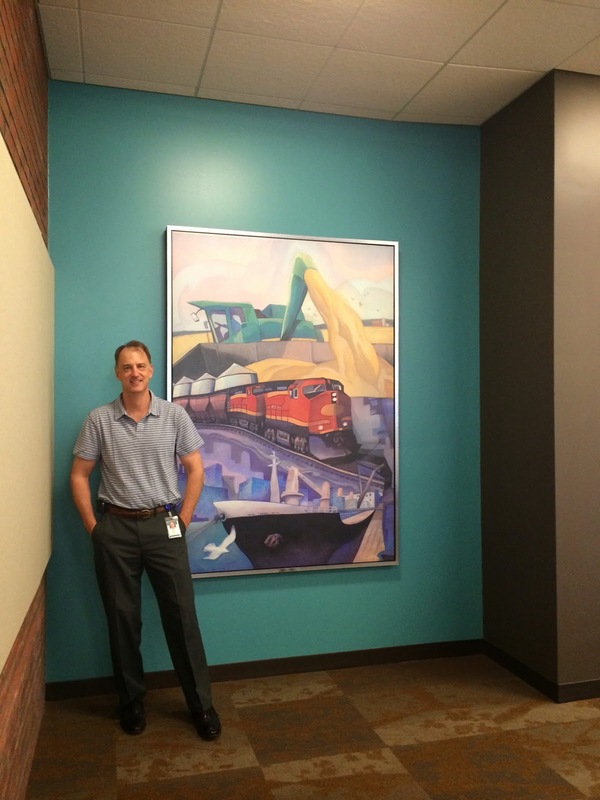 The painting is part of a bigger environmental design installation throughout the hallways leading to the lecture hall, featuring life-size corn stalks, wheat fields, soybeans and 11-foot oil pump jacks and electric lines -- representing commodities you see in the rural landscape. These white on white images line the hallways and are paired with dimensional, brushed aluminum quotations from famous economists. CoBank is a cooperative bank serving vital industries across rural America. EnZed Design, an award-wining design studio and strategic marketing partner, created the project. Not Gary, Arthur, the model, is 6'4" feet tall, and is doing a marvelous job demonstrating the scale of Gary's piece.